The 31 Days of Horror is not just about scary movies, slashers and the macabre. Sometimes its about good ole goofy fun with a ghost or two. 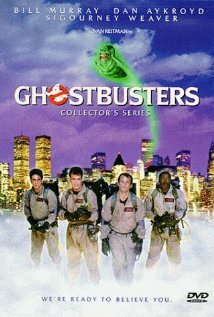 Being a child of the 80s Ghostbusters was one of my favorite movies when it was released in 1983. I remember the craze, I remember singing the goofy song and drawing the little ghostbusters logo on everything! Plot: Three odd-ball scientists get kicked out of their cushy positions at a university in New York City where they studied the occult. They decide to set up shop in an old firehouse and become Ghostbusters, trapping pesky ghosts, spirits, haunts, and poltergeists for money. They wise-crack their way through the city, and stumble upon a gateway to another dimension, one which will release untold evil upon the city. The Ghostbusters are called on to save the Big Apple.